A/Vaux HDMI matrix switchers provide not only an intelligent routing core, but also optionally incorporate analog-audio or digital-audio switching sections to form a complete whole-house AV distribution system. Our PureSpectra switchers provide fast-switching full-matrix HDMI routing, with exceptional EDID and Key management for HDTV sources and sinks, and Audio-Insert which allows different audio to be fed to any HDMI output zone. Of course we support resolutions up to 1080p/60Hz, support 3D formats, up to 36-bit deep-color, lossless Dolby TrueHD, DTS-HD Master Audio, and other audio formats. a Digital-Audio input, or an Analog-Audio input, depending on switcher model. All of our switchers have extensive features such as saving multiple states for Paging and Presets, controlling multiple zones together using our Group commands, and Breakaway routing commands for video or audio only, audio-and-video, and audio-insert. Extended color gamut (xvYCC). DVI up to 1600x1200/60Hz. Input EQ. 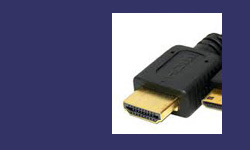 Compatible with version 1.4a HDMI and version 1.4 HDCP standards. Our PureSpectra RGS-808HDA and -808HDAX switchers quickly switch HDMI signals, and include a high-fidelity analog-audio matrix/preamp for whole-house audio distribution. Auxilliary S/PDIF digital-audio inputs allow for insertion of different audio sources into any HDMI zone. The HDAX version also include analog-to-digital conversion of the eight analog audio sources, for audio insertion into HDMI zones. 8-source by 8-zone HDMI, plus 8-source by 8-zone Stereo-Audio section. Also has eight Digital-Audio inputs. 8-source by 8-zone HDMI, plus 8-source by 8-zone Stereo-Audio section, incorporating an analog-to-digital converter (ADC) to allow stereo-audio sources to be digitized and inserted into HDMI output zones. Also has eight Digital-Audio inputs. A/Vaux’s RGS-808HDD includes both an HDMI matrix, and a digital-audio section. The audio from HDMI sources is internally extracted, and, along with sixteen external S/PDIF digital-audio inputs, provides a total of 24 inputs to the digital-audio matrix. Digital-audio can be routed to any of the eight external outputs, or fed internally to any HDMI zone for audio insertion. 8-source by 8-zone HDMI, plus 24-source by 16-zone Digital-Audio section for routing external inputs, or extracted HDMI source audio, and switching these signals to either external outputs, or inserting them into HDMI zones.